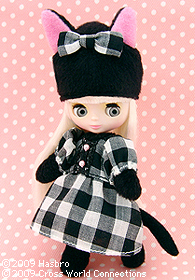 Introducing the cutest black cat, Petite Blythe "Neromin"! Hello! I am a black kitten, Nero! Under a gingham check dress I am wearing cat body suit that covers my paws. My charm point is my loooong tail! I decorated my kigurumi head with a cute ribbon that matches my dress perfectly! My hair style is a platinum white straight long hair. 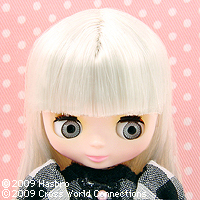 My eye color is silver, and everyone says my eyes are perfectly match hair color and beautiful! 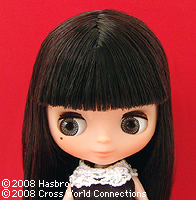 The famous Neo Blythe "Night Flower" comes back as Petite Blythe! 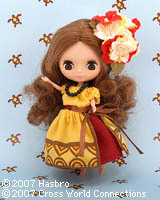 Her dark brown hair, fair skin with natural makeup and fashionable outfit echos the style of the "Night Flower" Neo Blythe! She has a sweet but sophisticated look. 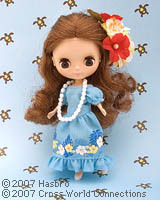 She is a must have for your fashionable Blythe collection, and is the perfect companion for Neo Blythe "Night Flower"! 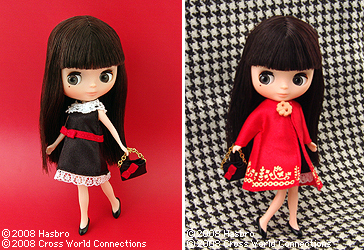 [ The set includes: ] Doll, dress, coat, bag, shoes, and stand.